Those who attend Friday’s downtown Halloween Block Party will witness one of Cleveland’s most historic and spookiest moments of all time, said officials. 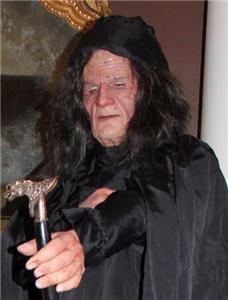 Starting at 7:30 p.m., Tall Betsy – the famous goblin thought to have been retired forever to a mausoleum at Fort Hill Cemetery – will return for only the second time in 15 years. The goblin will reportedly pose for pictures with Block Party attendees for one hour, from 7:30-8:30 p.m., sponsored by Check Into Cash. As part of Cleveland's Halloween festivities, Cleveland storyteller Deborah Holland has performed "Tall Betsy" for years. Ms. Holland is an active member of the Cleveland Storytelling Guild. Sources have revealed that Tall Betsy will be a new version of the goblin – designed by professionals in Hollywood with an authentic new face and hands. Mr. Jones said the new look for the goblin was created by Hollywood Mask Masters in Van Nuys, Ca. using real human hair. The face and hands were intended for a big-budget Hollywood film that never got off the ground. The Block Party was the setting for Tall Betsy’s once-in-a-lifetime reappearance, Mr. Jones said, since the annual Halloween event was originally created as a result of Tall Betsy’s popularity that drew thousands of trick-or-treaters to historic Centenary Avenue. The goblin appeared in Cleveland from 1980 to 1998. According to legend, Tall Betsy was a very tall woman who walked the streets of Cleveland late at night around 1910 to 1920. 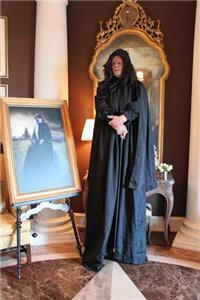 She was also known as Black Betsy or the Lady in Black. Zac Adams, an award-winning filmmaker from Nashville, created a documentary about the goblin in 2012. The documentary aired on NBC and won a Telly Award in 2013. Mr. Adams visited Cleveland in 2011 to interview Mr. Jones, Mayor Tom Rowland and others who had firsthand knowledge of Tall Betsy. Mr. Jones’ mother, Gincy, as well as his grandmother, Marie Shultz Slaughter, told him stories of a Tall Betsy goblin during his Cleveland childhood. Mr. Jones’ version of the goblin resides in Fort Hill Cemetery and stands more than 7 feet 6 inches tall. The goblin became so popular that in 1986, MainStreet Cleveland — the city’s downtown revitalization group — organized the Halloween Block Party that included games, costume contests and treats. Mr. Jones liked the idea because he needed something to draw the crowds off of Centenary Avenue after 8 p.m. The state of Tennessee named Tall Betsy “The Official Halloween Goblin of Bradley County” on May 24, 1989. Mr. Jones said the Tall Betsy legend eventually spread outside of Cleveland and became such an event that in 1993 his family took an official count of how many people came to their house at 150 Centenary Ave. NW. Tall Betsy retired in 1998 after drawing a Halloween Block Party crowd of 25,000. A helicopter film crew captured the event and the large crowds on Centenary Avenue. The Block Party was dedicated in honor of Tall Betsy’s 25th anniversary in 2005. Pictures of the realistic Tall Betsy will be regularly added to TallBetsy.com starting today.